For other uses, see Cartmel (disambiguation). 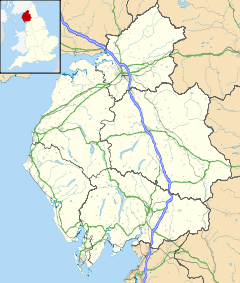 Cartmel is a village in Cumbria, England, 2.2 miles (3.5 km) north-west of Grange-over-Sands close to the River Eea. The village, once known as Kirkby in Cartmel, is the location of the 12th-century Cartmel Priory. Historically in Lancashire, boundary changes brought it into the newly-created county of Cumbria in 1974. The place-name is first attested in the Histories of Simeon of Durham, where it appears as Ceartmel. It also appears in the Pipe Rolls of 1177. The name means "sandbank by rocky ground", from the Old Norse kartr (rocky ground) and melr. The village has more recently become known as the "home of sticky toffee pudding". Its racecourse hosts popular meetings two or three times a year, traditionally in Whit Week. The ancient parish was traditionally known as the Land of Cartmel – an area quite separate from the Furness peninsula. Holker Hall, associated with the Cavendish family and the Dukes of Devonshire, is within the original boundaries of the parish. The village is served by Cark and Cartmel railway station, opened in 1857 by the Ulverston and Lancaster Railway, on the Furness Line. Cartmel Fell, one of Wainwright's Outlying Fells, is about 7 miles north of Cartmel. Cartmel was the favourite holiday spot of the Lancashire dialect writer and BBC broadcaster, Thomas Thompson, who authored sixteen books on Lancashire people and their communities. The frontispiece in his book Lancashire Brew is 'Cartmel from an etching by Joseph Knight', the founder of the Manchester School of Painters. Cartmel Church of England Primary School is the village primary school. Cartmel Priory School takes pupils aged between 11 to 16 from around the Cartmel Peninsula. ^ Eilert Ekwall, The Concise Oxford Dictionary of English Place-names, p. 89. Wikimedia Commons has media related to Cartmel. This page was last edited on 8 November 2018, at 12:36 (UTC).